Our friends Nancy and Mike are once again kindly supporting us with another Poetry in the Crypt event. 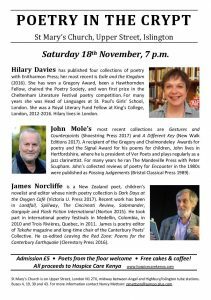 This evening of poetry will take place in The Crypt at St Mary’s Islington on Saturday 18th November 2017 at 7pm. Hilary Davies has published four collections of poetry with Enitharmon Press; her most recent is Exile and the Kingdom (2016). John Mole’s most recent collections are Gestures and Counterpoints (Shoestring Press 2017) and A Different Key (New Walk Editions 2017). James Norcliffe is a New Zealand poet, children’s novelist and editor whose ninth poetry collection is Dark Days at the Oxygen Café (Victoria U. Press 2017).